If you’re looking for a fun project to do with the kids, Mini Grass Houses with Sponge is a great project. It’s the perfect experiment the whole family will love! It is also one of the very best ideas you’ll ever come across for getting kids of all ages into the idea of gardening and plant care. There’s nothing quite as satisfying as watching the fruits of your labor grow into something wonderful right before your eyes. This fun DIY craft project doesn’t take much in the way of supplies or time. Dish sponges are cheap, grass seed doesn’t cost much either. While you might wonder if the grass grows well inside the sponges, don’t worry. Sponges are porous and provide ample room for the grass seed to take root and sprout. The small holes in the sponges hold water droplets, and provide a good growing environment. You could make this house in your own trailer or park model, or design you can use your imagination to create. 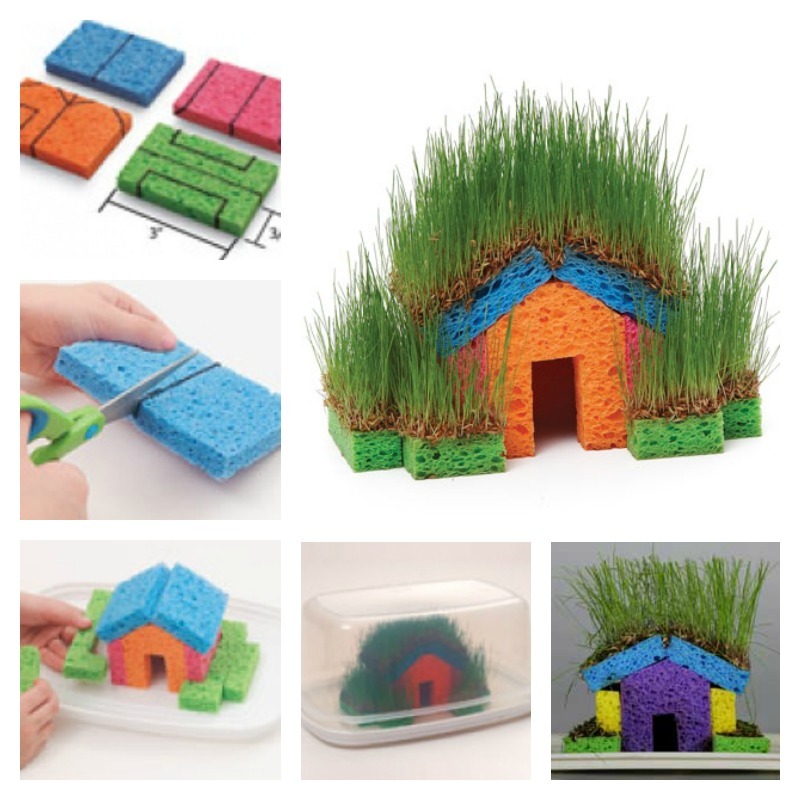 Check out the steps below and see how easy it is to make your own Mini Grass Houses with Sponge. Large plastic food storage container. Wet the sponges slightly to create a good growing surface. Use the ruler to mark the halfway point on the sponge you will use for your roof. Insert the pointed end of the scissors into the side of the sponge and cut along the line to create a hinge. Do not cut the two sides in half. Measure and divide the side wall in half to create two pieces. Cut a sponge in half for the front and back walls. Cut a door out of the front and cut the tops into peaks to meet the roofline. Divide the last sponge in half lengthwise and cut a small section the length of the house out of each one, then ‘‘wrap’’ around the walls of the house. Fit all the pieces together and secure with floral pins, attaching the roof to the sides then the front and back walls. Attach the lawn last. Place the house on an upturned lid of a plastic container. Spray the house and sprinkle grass seeds on the surfaces. Keep the house moist, warm and well-lit. Place the container over the house but leave it ajar on the lid to prevent mold. When your grass needs mowing, remove the cover.